Order Spaghetti (with or without Meatballs) with Garlic French Bread and a Side Salad for $13.10 (for the 13.10 miles you’ll be running the next day! ), and a portion of the proceeds from each spaghetti dish will be donated to Race For A Soldier. Not running? Come down anyway and support a great cause! It's official! Immediately before the race members of the Y will lead the crowd with an energetic Zumba warm-up. You haven't done Zumba if you haven't done it with 1,000 friends! The Gig Harbor Family YMCA is pleased to be the start and finish location for the Second Annual Race For A Soldier Half Marathon. Race participants are welcome to access the facility at no cost after the race. Sea Gals will cheer you on at Mile 12! To represent the Seahawks in sponsoring the 12th mile, members of the Sea Gals will be at the sidelines to cheer you on through the final stretch. Just one more reason to come out and support our soldiers! Read more about Sea Gals will cheer you on at Mile 12! Join us at Emerald Downs on August 26th! On August 26th, Emerald Downs will help our soldiers by showing support for Race For A Soldier! In addition to recognizing our event, members of Rainier Therapeutic Riding will be on hand to give a presentation of their program, and a $10 BBQ plate will be featured with a portion of the proceeds going to Race For A Soldier. Read more about Join us at Emerald Downs on August 26th! Dogs enlisted to aid veterans with PTSD harder to come by? Recently retired Army major James "Jimmy" LaCaria says he was afraid to leave his apartment before he got Kaeci, his 5-year-old mixed Australian blue heeler and kelpi service dog. Jimmy LaCaria and Kaeci attend a group meeting at an El Paso hospital last month. LaCaria, 36, from El Paso, was diagnosed in 2010 with post-traumatic stress disorder (PTSD) following combat tours in Iraq and Afghanistan. He had been in and out of inpatient psychiatric treatment facilities before his psychiatrist recommended he get a service dog to help him cope with the anxiety and nightmares caused by his debilitating condition. "Even after getting psychiatric help, I was still afraid to go outside. I was afraid to go into public places or anyplace that had a crowd," LaCaria recalled. "With Kaeci, I'm able to do that. I can have more of a normal life." An Army policy implemented in January, critics say, has made it harder for soldiers such as LaCaria who are suffering from PTSD and traumatic brain injuries to have specialized psychiatric service dogs on military posts. 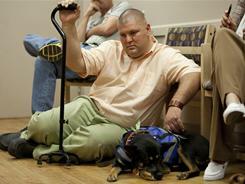 Read more about Dogs enlisted to aid veterans with PTSD harder to come by? After six tours of duty in Iraq and Afghanistan, Staff Sgt. Aaron Heliker's luck ran out. Staff Sgt. Aaron Heliker, now a volunteer with Rainier Therapeutic Riding, rides with founder Debbi Fisher. A roadside bomb left him with third-degree burns, a traumatic brain injury and nerve damage to one leg. But the unseen wounds became the most disabling of all. The 27-year-old who rode motorcycles, was a whiz at auto-body work and had wanted to be a soldier since he was old enough to ask his mother to "buy some army pants" could no longer tolerate being around people. He was anxious, hypervigilant, expecting attack. Memories rushed in of his last tour in Afghanistan, the five-hour attack by insurgents his convoy fended off, the soldier he found bleeding to death but was unable to help. To block out the memories and the surges of anxiety that made him feel always ready for battle, he began to drink. He was diagnosed with post-traumatic stress disorder (PTSD) and sent to a lockdown mental-health facility for veterans. Faced with overwhelming physical pain, afraid of being close to anyone, and so mired in despair that he could see no hopeful future, Heliker didn't want to continue living.